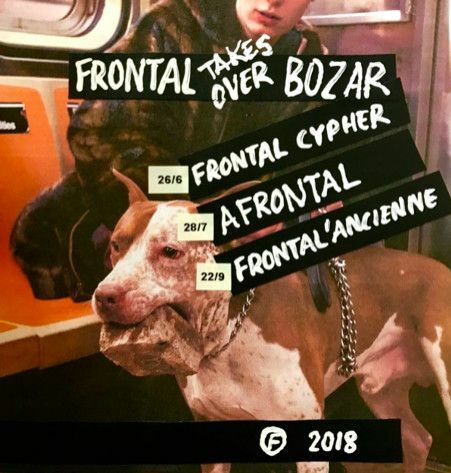 Frontal is a Brussels hip-hop collective founded by Stikstof. They have a weekly radio programme on Bruzz hosted by Shabba, DJ Proceed and DJ Vega, plus their own recording studio and record label that releases discs by artists such as STIKSTOF, Nag & LeFto and Zwangere Guy. They also organise regular events and workshops in Brussels and elsewhere. 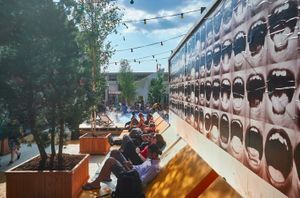 Opening evening '26 June > Frontal presents Rapcypher Deluxe’ is a tradition in rap culture in which rappers form a circle to rap in turn to the beats chosen by the DJs. A talent for improvisation and versatility is a must! House DJs and hip-hop institutions DJ Vega and DJ Proceed close the evening. ‘Afrontal 28 July > Frontal’ adopts a different style for the side project ‘Afrontal’ that focuses on Afro music. From roots music to the new electronic variants, from live bands to DJ sets… the dance floor has never looked more attractive. ‘Frontal Takeover (date to be determined) > Hiphop’ gives a voice to those who are rarely heard. Social criticism and disobedience are part of their DNA. Frontal celebrates the most rebellious side of hip-hop with sharp DJ sets and images to match.